March 26, 2019 By Becky Leave a Comment By clicking on our links, we might make a SMALL commission - Thanks for the support! See our full DISCLOSURE here. To get this great price, use promo code O3RZQ6EN at checkout! 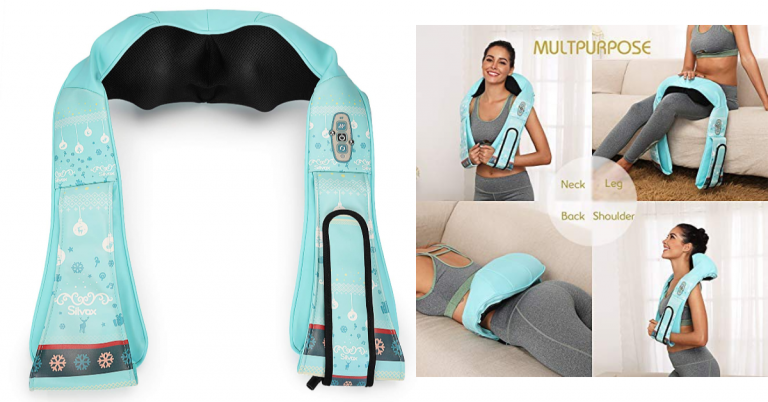 With 8 kneading roller nodes, the neck massager provide deep tissue massages on your neck, shoulders, upper back, lower back, waist, foot, tights, calves, legs, feet and arms – helping your full body parts to release stress, relieve sore muscles. Built-in rechargeable battery (also can use it while charging) with TWO hour run time! Hands free belt to free your hands while deep tissue massaging either in standing or sitting posture for a customized relaxing and full-body massage to revitalize your body. With infrared heat, it can be used to ease muscle tension, stress and promote blood circulation. Built in a Bi-directional movement control to mimic the motion of in-person massage experience. This 3D shiatsu massager will auto-reverse each minute for better distribution of massage effects and shutdown in 15 mins automatically.